It’s a fickle old thing, fashion. One minute you can’t leave the house unless you are wearing ripped jeans and leather armbands; or dungarees and a bandana; or a bubble skirt; or neon; or Doc Martens; or shoulder pads. The next minute, you wouldn’t be caught dead in any of these. Unless, of course, you are a hipster and are wearing them in a witty, post-modern and ironic sense 😉 But for the rest of us not plagued by hipster sensibilities, fashion is as fickle and inexplicably changeable as the wind – and it’s no better in the world of food and wine. What’s perfectly acceptable, if not de rigeur, to serve at dinner parties one year, suddenly becomes totally laughable the next (hello avocado Ritz, chicken Kiev and baked Alaska). And while we were all perfectly besotted with Chardonnay in the 1990’s, today it seems annoyingly fashionable to drink ABC (anything but Chardonnay). But of course, a wine’s falling out of favour also sets the stage for it’s revival. 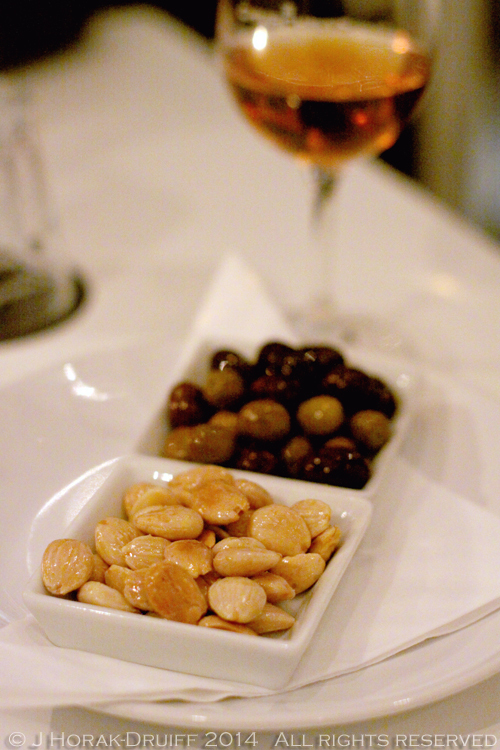 A nice example of this is sherry’s recent change in fortunes, with trendy sherry bars popping up all over London. Now it seems that Port might be set for a similar revival, if the chaps at Churchill’s Port have anything to do with it. Tired of seeing port associated with a glass of something left out for Santa Claus or with portly (hah!) older gentlemen with bulbous red noses, they have opened London’s first (and, to my knowledge, only) Port pop-up bar near Soho Square. When Churchill’s opened in 1981 they were the first British Port wine company to have been established in over 50 years – so the company has a but of a history of trailblazing! If I had expected Churchill’s Port House to look a little rough around the edges because of its limited 3-month residence, I was in for a surprise. It’s a small but beautiful and welcoming white space with white lacquered tables, matching chairs, fairy lights and some framed photographs and wooden port presentation boxes as the only adornment. On the two upper floors there is more seating, including a small gallery space on the top, a chef’s table with a view of the minuscule kitchen in the middle, and the small restaurant where I sat at ground level. On the menu is, unsurprisingly, a selection of Churchill’s Port (White; 10 and 20 year old Tawny, LBV, Crusted, and a single quinta vintage Port). And although you may have thought that port was only for sipping on its own after a meal, here the ports are all carefully paired with tapas dishes designed by chef Xavi Meroño. We started with a glass of Churchill’s White Port (£6) – a beguiling caramel colour, a slightly honeyed nose, wonderful hazelnut flavours on the palate and a fantastic long, balanced butterscotchy finish. This was served with excellent roasted Marcona almonds (£2.50) and a selection of small, intensely-flavoured Spanish olives (£2.50). This was followed by a glass of the Churchill’s Estates White wine (£5), a blend of Viosinho 30% and Rabigato 70% (both indigenous Portuguese grapes) – rather like a pleasantly lemony Sauvignon Blanc. The food that arrived with this was the charcuterie board for two (£14), a plate of toasted baguette slices with tomato paste, and a small bowl of garlic and chilli prawns (£6). The charcuterie consisted of a decent-sized selection of pata negra ham, chorizo, Iberico salsichon with peppercorns, and cecina (a Portuguese air-dried beef similar to Italian bresaola). 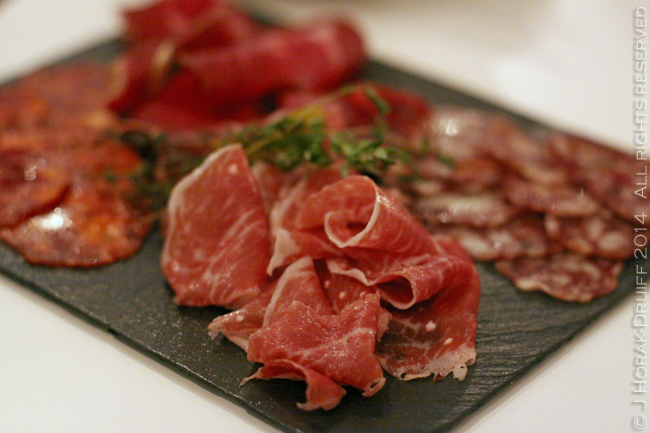 My standout favourite was the silky pata negra ham, closely followed by the salsichon. The prawns arrived, looking innocuous enough but from the first mouthful they announced quite clearly that they were Not Your Ordinary Prawn. Fat, sweet and juicy, they were drenched in butter heavily laced with pungent garlic punchy little dried chillies – exactly how I like them, and exactly how I always enjoy them in Portugal. Both Ailbhe and I kept a keen eye on each other to ensure that nobody took more than their fair share. The only disappointment was the bread and tomato as the slices were over-toasted and too crispy to be any good at mopping – either the accompanying tomato or the chilli garlic butter! The white wine was good with the prawns, buy I found that the last of the white port in my glass provided a far more spectacular match for the charcuterie. The next dishes to arrive were the Winter salad of roasted sweet potato, beetroot and soy mushrooms (£6) and the Filo pastry baskets with morcilla Iberica, roasted chestnuts and a mango-chilli sauce (£7). The salad was perfectly pleasant as salads go – lots of peppery rocket made more substantial by the addition of the roasted root vegetables and a very tasty dressing. But the star of the show was without a doubt the morcilla Filo parcels – not only gorgeous to look at but also light and crispy on the outside; rich, earthy and meaty on the inside. The sweetness of the mango-chilli sauce is also just what the morcilla needed – a truly fantastic dish. 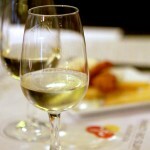 With these dishes we were served a glass of Churchill’s Estates Touriga Nacional (£7) – wow! The attractive nose of ripe summer berries leaps out of the glass to welcome you, and the slightly rough-around-the-edges palate sees the berry theme through, with the addition of some mough puckering tannins. All in all, a super-accessibkle wine though. By contrast a glass of the Churchill’s Estates Quinta da Gricha (£9), their flagship red blend of Touriga Nacional, Touriga Franca, Tinta Roriz, Tinta Francisca and Tinto Cão made from 50 year old vines, was a far more classy and complex affair with flavours of cinnamon spice, dark chocolate and coffee, combined with surprisingly soft tannins. It’s a lot less fruity than the Touriga Nacional, but a lot more subtle and definitely worthy of its flagship status. Next up was the artisan cheese board for two (£12) consisting of a selection of four Spanish cheeses, grapes, walnuts and cubes of membrillo (quince jelly). The cheeses in question were cabrales (a blue goat’s cheese with particularly fine blue veining); raw Montanera raw milk goat’s cheese – soft and very pungent; and two hard cheeses namely Idiazabal and Zamorano. To match this, we had a glass of the Churchill’s Late-Bottled Vintage (LBV) Port (£7) – a deep ruby colour with violet tones at the edges. The nose was quite herbal – rather like pine sap with touches of mint and underlying dark berries. The palate was superb – dark fruit but with herbal, minty notes and a rich, jammy palate with cocoa notes and grippy tannins. Last on the agenda were a couple of desserts, namely the Tanzanian chocolate and cardamom truffles (£5) and the passion fruit cheesecake (£5). The truffles at first seem on the small side, but one bite into their dense, gooey interior reveals a richness that would make it unwise to upsize them! The chocolate has delicate fruity notes, and I always love the warmth that cardamom lends to any dessert. So all good on the truffles… but oh the cheesecake… Rather than a traditional cheesecake, this was a take on a cheesecake served in a Kilner jar, with chunks of digestive biscuits in the base; a silky cream cheese mix dolloped over them; and topped with fresh passion fruit pulp. Simple, but completely decadent and one of the best desserts I have had in ages. The wine served with this was a glass of Churchill’s crusted port (£8), a port of vintage quality that is a blend of various years and is aged in oak casks before being bottled and matured in bottle for at least 3 years before being sold. The year on the label is the year of bottling. This still had the jammy fruit notes but was also showing some more complex, nutty characteristics as a result of the bottle age. We had arrived at 19h00 and in what seemed the blink of an eye, it was after 23h00 and time to run for our trains – time seriously does fly when you are having fun. As I said, the space is welcoming and relaxed, especially on a rainy Friday night, and they scored big bonus points from me for a soundtrack that included The Doors and Marc Bolan & T.Rex. The food was excellent, especially considering the space constraints and the temporary nature of the venue, and although not all the ports were perfect matches for the food, all were delicious and the white port was definitely something I need to drink more of. For what we had, the bill would have come to a rather substantial £60 per head, but to be fair we could easily have done with less food, and it is possible to purchase a flight of 3 different Ports for a more reasonable price than our a la carte extravaganza. Staff are clearly passionate about what they are doing (Max who looked after us is the grandson of the Churchills’ founder). It’s a wonderful way to while away an evening but you’ll have to be quick – Churchill’s Port House is only open until 22nd Feburary 2014 every Thursday, Friday & Saturday for lunch and supper. DISCLOSURE: I enjoyed this meal as a guest of Churchill’s Port House but received no further remuneration to write this post. All opinions are my own and I retain full editorial control. If I were in London I’d make a beeline for this place, it sounds great and your pictures of the food had me drooling! My knowledge of white port is limited to getting plastered on the stuff in my matric year – partying on Clifton 3rd beach one night – oh those salad days when I was but a green girl. Seriously though, white port was quite cheap in SA back in those days, overly sweet, very alcoholic and sold in big demijohns as I recall. Time I think to give it another try. Pop ups like these are such a good idea, I think so many people consign port to Christmas and paired with stilton! Port is something I never drink. I did buy some in for Christmas, but it is still unopened. Maybe I need to do something about that. Oh so this was the place I couldn’t get too! What a damn shame as it looks divine – those photos certainly do it justice! It was a pop up I believe… and now popped under… shame.